family of John Wanless & Elizabeth Olivia Robinson (who may not be married yet in 1851) in or around Brockville, Leeds co or Kingston, Frontenac co.
family of George Wanless & Ellen Wanless of Carillon, Argenteuil (then Deux Montagnes) co.
Deux Montagnes (Two Mountains) [now Argenteuil] Co.
on page 69, Elizabeth Jones is the wife of Thomas Wanless. Wood frame house with 1 story, 3 families, public saw mill, grist mill, oat mill, and carding mill. Lives in a log house, 1 story, only occupant. Family of James (45) & Elizabeth (46) Taylor from Scotland follows. The Agricultural Census reports that Martin Wanless had a concession of 1 lot on North River and La Bais. The Agricultural Census reports that Thomas’s concession was 1-1/2 lots on North River, under cultivation as gardens or orchards. Mary & Andrew are also enumerated with husband/father Henry Wandless below. Apparently they are visiting her father here. Next dwelling is labeled “Lodge at College”. 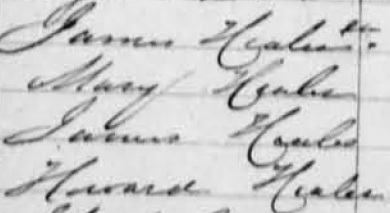 This family’s 1861 census entry is also in the 1851 Canada census at ancestry.com. Log house, 1 story, 1 family. Sided timber house, 1-1/2 stories, 1 family. Village lot, V.K. Hill [Van Kleek Hill?]. Frame house, 1 story, 1 family. Indexed as Wanles, but looks more like Henles or Haules or Heales to me. 1-story frame house, 1 family.